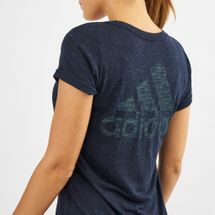 Succeed every time in the adidas ID Winners T-Shirt for women. Built for everyday wear, it features a regular fit and a curved V-neck. A curved hem adds contemporary styling as a large adidas logo appears printed on the back.